This is just one segment of a 4400 mile National Scenic Trail. There are several hundred continuous off-road miles which can be hiked within the Manistee National Forest and northward. The trail continues southward in Newaygo County and to the north in Mason County. Parts of this section are open to bicycles. 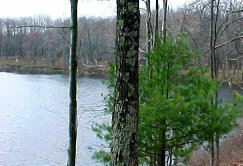 Bowman Lake- Bowman Lake is a small kettle hole lake with 4 primitive, walk-in sites. There are tent pads and fire rings with grates. Bowman Bridge- Bowman Bridge Campground is a National Forest Campground on the Pere Marquette River reached by a side trail from south of 56th St. Campsites have picnic tables, fire rings with grates, latrine, water. 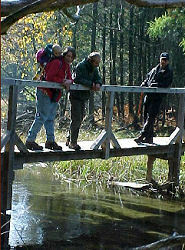 Timber Creek- Timber Creek Campground is a National Forest Campground on the Pere Marquette River reached by a side trail from south of 56th St. Campsites have picnic tables, fire rings with grates, latrine, water. McCarthy Lake- McCarthy Lake is a small inland lake that is accessible by vehicle and just a few yards east of the trail. It is a popular summer camping site for local people because it is such a delightful location. No amenities, but very pretty. There are many obviously used campsites on the north side of the lake. Bear Track- If you prefer more ameneties, this National Forest Campground is one mile off the trail. Campsites have picnic tables, fire rings with grates, latrine, water. The turnoff side trail to reach it is several yards east of from Tyndall Road (the Mason/ Lake County border). Commercial- There is one commercial campground on 5-Mile Road where the trail has its longest road walk within the Manistee National Forest. Description of the southern half of this section is sketchy at this time, but begins at 96th St, approximately the Newaygo / Lake County line and proceeds north. This is also the border between the Western Michigan Chapter of the NCTA's responsibilities, and Spirit of the Woods. A bit north of 96th St. you cross a gated forest road at an oblique angle, and enter the Sterling Marsh section where the trail used to be difficult to follow and muddy. Begun in 2009, raised boardwalks are being built in an attempt to make this section more walkable. Private land constraints prevent the maintainters from moving the trail to higher ground. You will easily note the boundary since the trail is often tucked up against a wire fence hung with flagging tape to keep it on the highest ground possible. More boardwalk was added in 2010, and completion (more than a half-mile of raised walkway) is expected in 2011. Eventually you will pass an open area to your left which is the open water portion of Sterling Marsh. Great birdwatching! Cross Jenks Road (dirt). Continue north to 76th St, which you cross. The connector to the Trailhead is north of 76th St and enters the trail at an extreme angle from the SW.
You will cross several private dirt roads, and pass along several large portions of private land. One of these has provided a lane for passage of the trail with fencing on each side... not very appealing, but at least the trail gets through. Soon you cross two small split log bridges. When you cross a small stream right at the edge of the bluff to the river you can find an old road angling down to the river for good water access. Gleason's Landing is directly across the river, but cannot be reached from the trail without a boat. This magnificent white pine is on the right after a bit. Soon you come down a slight hill and cross a bridge made of 3 logs above a narrow, dry creek. Now begins a more detailed description. As of March 2010, there are quite a few downed trees in this section, but it's not too difficult to get through. The blazing in this section needs work, but the treadway is incised enough to be able to follow it. Trail is level through young red pine and oak. About 30 minutes from the triple-log bridge, cross a little-used, dirt two-track that may be private. Watch next for a buried rock in the trail. It's not huge, but is big enough to trip on. The mystery to me is that with so few rocks here, why the trail is routed right across the top of one! Trees change from red to white pine after a more open area. Soon the trail goes through a wet section where there are multiple small puddles and hummocks with trees. The trail works its way through here, and you may get wet feet. The addition of corduroy a few years ago hasn't really helped. Begin to climb gradually, but definitely. About 10 minutes past the rock, descend to a pair of log bridges over the end of a perched wetland with a pond. This is a reliable water source. Cross another little-used private road, in just a couple of minutes, and enter an area that was planted in trees with a large machine. The trees mostly died, but the humped furrows remain, with the trail cutting across them. 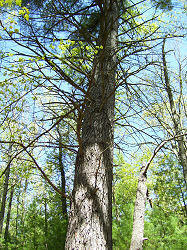 The area alternates between young white and red pines, sometimes thicker, and sometimes more open. About 15 minutes past the private road, reach the connector trail to Bowman Bridge (0.4 mile) is marked with white rectangles and goes to the right (north). There is a signpost at this corner. This campground was severely damaged by wind in 2005 but is was re-opened in 2007. In 10 minutes, cross a more-used dirt two-track on fairly level ground. 5 more minutes and you emter an area that was badly damaged by the 2005 wind storm. The trail is clear, but there are many large downed trees in the woods. Almost immediately you cross an un-named stream on a wooden bridge. (There is a pond a short way upstream from here which can also be reached from the previous dirt road.) Not sure if the stream is reliable in summer. Trail begins to climb a bit. In 10 minutes, cross dirt Mack Rd., the woods is now slightly older. Continue to climb for 3 minutes and a small ridge will rise in front of you. The trail bends right to follow along on the slope of that hill, climbing it obliquely, with a valley on your right. There is a wetland in the depths which is hard to see in the summer, but is visible when the leaves are off. The trail remains on the side of the hill, finally passing over the shoulder, rather than the height of land. Continue to climb and you will see an old road on the ridge top beginning to parellel the trail on your left. 10 minutes past Mack Road, reach a well-used jeep trail which ascends from the right. The trail and the old road come together at this crossing. But only the trail continues on the opposite side. Continue to the crest after crossing the road. The trail gradually turns north north-west. Cross a small saddle, and the high ground will now be on your right with a valley to the left. Continue down from the saddle on benched trail almost to the valley bottom. 10 minutes after the jeep trail, you will climb the road berm to reach 56th St. Cross the road and watch for the carsonite post on the far side. The trail crosses the open wide shoulder and enters the woods at another post. Descend with a ridge on your left and a flat valley on your right. The connector to the Bowman Lake Trailhead is reached about 4 minutes north of 56th St. Pay attention, the connector turns sharply back to the left and uphill. There is a 4x4 post at that turn. Access- parking at 76th St. for about 6 cars, information kiosk, fee site. Parking at 56th St. for many cars, information kiosk. Restrictions- No horses or motorized vehicles. No camping within 200 feet of the trail. No bicycles south of 56th St. Distance and time- 10.1 miles, about 4 hours. Condition of Marking- adequate, except possibly near Sterling Marsh- treadway is slightly sunken so should be able to be seen even with fresh snow. Treadway- packed sandy forest soil. 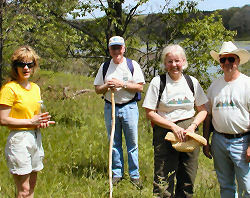 Near Sterling Marsh the trail is hummocky and may be under water in the spring. Grades- flat to moderate with only a few short sections which could be called moderately steep. Ecosystem- swampy woods,with large open Sterling Marsh to the west side of the northern end of this segment. Other points of interest- Sterling Marsh. Description of most of this section is sketchy north of 40th St. The description begins at 56th St and proceeds north. Bowman Semi-Primitive Area is one of my personal favorites. It is dotted with small glacial hills and pocked with kettle-holes. Bowman Lake is the one remaining one which has water. This area is bounded by 56th St, Mack Rd, Hamilton Rd, and 40th St. The trail winds through this section, going up and down small hills. It is possible to make several loops within this area by using the ski trails. The Trailhead at 56th St is the closest access to Bowman Lake camping. You can not drive to these sites, which makes them a very nice place to find quiet camping. There are 4 designated sites with fire rings and tent pads. Two of the sites are on the east side of the lake, two (including one larger one) are on the west side. From the parking area you can walk directly north on a pathway which then drops steeply to the lake. Or you can follow the connector to the NCT from the right side of the kiosk to descend more gradually to the NCT. Turn north and in about 1/4 mile you will reach a 2-track. Turn left on this and in just a few steps you will reach the lake. 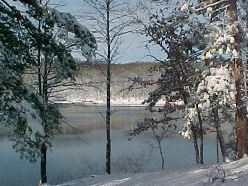 You can also access Bowman Lake ski trails here. Detailed description Bowman Lake Trailhead to 40th St. Leave the parking area on the connector trail behind the kiosk. This trail slants down the east side of a ridge and meets the main NCT in 0.1 mile. Pay attention! There is a 4x4 post here. If you want to go south on the NCT you need to make a hard right back to the south here. Otherwise, continue north at the base of the ridge. 0.3 mile- cross an old woods road. (If you want to go to Bowman Lake, turn left here, a few steps in the cut through the ridge will take you to the lake. Mack Road is 0.25 mile to the east on this closed road.) The NCT crosses the road and climbs up the ridge. You are now above the lake on your left, and another dry kettle hole on your right. There are several unofficial trails down to the campsites on the lake, but there would be less erosion if you would refrain from using these. 0.85 mile- reach the head of a large almost dry kettle hole to the west. This one may have standing water in the spring and still supports wetland plants such as leatherleaf. 1.0 mile- reach the head of another dry kettle hole to the west. 1.2 miles- reach another, more faint, old woods road. The NCT turns sharply west on this in an area of young white pine. (If you turn right you will come to Mack Road in about 0.25 mile.) The trail will soon turn northwest again and begin climbing up a valley. 1.35 miles- reach the head of the valley and begin to wind through an area of the small hills called kames. 1.7 miles- cross a very old road in a dip. 1.75 miles- reach the top of another knob. 2.0 miles- you will cross a rut of uncertain origin 3 times and then reach the top of a double ridge, and begin to descend. 2.9 miles- cross another trail- if you take this to the right you will reach a parking area on 40th St.
3.05 miles- reach 40th St. When you reach 40th St, turn left on the road for 1/2 mile, till you reach the corner with Hamilton Rd. The trail angles back into the woods on your right. Cross a power line right-of way, drop to a small creek with a simple bridge and climb back up again. Reach Sulak Landing Road (established campsites down this road), cross and you will soon see the Pere Marquette River below and to the right. Descend to the river edge on about 40 steps built of cabled logs, and pass a campfire area. The trail quickly reaches S. Branch Rd. (paved). Immediately across the road is Upper Branch Bridge access with parking, latrines, water (sulfer, but very cold), and a boat landing. Turn right (north) on the road and cross the river. Continue uphill and across the railroad tracks (Marquette Rail). Turn right at the next corner on Wingleton Rd (dirt). In about 1 mile the trail turns north into the woods just past private hunt club property. Access- Parking at 56th St. for many cars, information kiosk. Parking at Upper Branch Bridge for many cars, fee site. Parking at US 10 (Timber Creek) for several cars by the information kiosk, fee site. Timber Creek is also a camping site. Restrictions- No horses or motorized vehicles. No camping within 200 feet of the trail except at the designated sites at Bowman Lake. Distance and time- 7.8 miles, about 3 hours. Ecosystem- Bowman Semi-Primitive Area is glacially formed kames and kettle holes. Oak and pine forest. Red Pine plantations. Other points of interest- Pere Marquette River is a National Wild and Scenic River. Description of this section is mostly complete, and begins at US 10 (Timber Creek) and proceeds north. Do not park on the highway. There is a trailhead at Timber Creek Campground with a spur trail to the main trail. The connector trail leaves Timber Creek Trailhead at the right side of the kiosk. Watch for a sign indicating the turn to the north because the trail cuts back at an angle and it would be easy to continue straight. But if you find yourself quickly at US 10, you have missed the turn, turn around! Travel roughly NNE over small hills. Pass a seat cut into the end of a large log which had fallen across the trail. You will cross several old 2-tracks, and then dirt 8th St. in about 3 miles. Enter a broad open valley of mostly decidiuous trees with scattered white pine. At one mile from 8th St the trail enters an area of denser medium-age woods and crosses an old woods road and then a designated ORV dirt trail. In another 1/4 mile join an old woods road, turn NW and begin going gently uphill. This road curves around the base of a low hill to the east. Come to a fork in two old woods roads and take the left fork. The road continues to curve right until you are walking almost NE. After 3/8 mile on the old road openings the trail leaves them and turns N into denser medium age maples. Begin climbing up the next ridge, and when you reach the top turn east. The trail follows the top of this ridge for about 1/4 mile with fingers projecting north and the heads of several valleys coming to meet the trail from that side as well. This is a particularly pretty area. Turn north to descend off the ridge by following one of the fingers of the ridge. There is a large red oak porcupine tree just to the west of the trail which is being actively lived in in 2007. The trail turns NE again. Pass through another valley between the ridge on your right and a small hill on the left. Deciduous trees on the left and more white pine on the right. When the trail veers into those pines you soon take a turn to the ENE and you will see Centerline Road through the trees. Roughly parallel the road for about 1/4 mile and reach the road crossing. Distance between 8th St and Centerline 2.75 miles as determined by pacing. Cross dirt Centerline Rd. In 1/2 mile the trail makes a turn to the NW and passes by a beaver dam, turn NE in another 1/4 mile and come out on dirt Mack Road after another 1/2 mile. Cross Mack Rd. and the trail goes slightly uphill through mixed open woods, continuing NNE. Angle E through a slight dip and a small grassy area, and return to the NNE heading. Several meanders through small rolling dips, angle N and cross a small bridge. In about 15 minutes from the road crossing you reach the top of the ridge surrounding McCarthy Lake and you will see it through the trees ahead and to your left. Make a sharp turn to the W and begin descending beside the lake which is now on your right. Reach lake level and continue along its south shore to the W. Water lillies, pickeral weed, other water plants. Mostly white pine woods here. The W end of the lake becomes more marshy with dense plants; the trail continues beside and then beyond this, turning N in another minute. About 30 minutes from the Mack Rd crossing, you reach McCarthy Lake access road. Climb gently away from the creek, pass through an opening with blueberries ringed with white pine. Re-enter mixed woods. 20 minutes from McCarthy road crossing, begin turning gradually N. and reach graded dirt 3-Mile Rd. Access- Parking at US 10 (Timber Creek) for several cars by the information kiosk, fee site. This is also a camping site. Parking at McCarthy Lake, although it is tricky to find unless you know the roads. 3-Mile Rd crosses Hamilton Rd, and 2 miles E of this intersection turn S on Mack Rd. In 0.7 mile a sand track turns E. Take this about 0.8 mile in to the trail crossing or 1 mile to the lake. Primitive campsites, no amenities, but beautiful. Distance and time- 9.3 miles, about 4 hours. Ecosystem- Xeric mature oak and pine forest. Red Pine plantations. Mixed northern hardwoods. 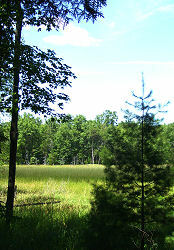 Other points of interest- McCarthy Lake is one of the prettiest campsites in the Manistee NF. You can take a side hike via dirt road to the site of the former Ward Hills fire tower. Views are somewhat grown in, but you can see rolling hills to the south and west from this point. Description of this section is mostly sketchy at this time, but begins at 3-Mile Rd and proceeds north. 3-Mile Rd is a good, graded sand road. The trail heads NE and then N to skirt private property. Slightly rolling terrain with 4 woods road crossings. Descend a long gradual hill to the flood plain, with 3 woods road crossings. Then the trail turns west. After another road crossing you will come close to, but not cross yet another old road. Cross the Big Sable River on the new, clear span, Vince Smith Bridge. This is a reliable WATER source. This area has nice white cedar. After the bridge continue N and cross dirt Anderson Road before reaching paved 5-Mile Rd. There is a small grocery/souvenir store 1/4 mile east of this point, the Sweetfern, There is NO parking allowed where the trail comes into 5-Mile Road from the south. Turn W on the road and begin a 2.5 mile road walk. You will pass a new commercial campsite on the N side, which only has sites with full hook-ups. They are reported to be not very friendly to hikers. Where paved Hamilton Rd turns S you will continue on dirt Elk Trail Rd which angles NW. Watch for where the NCT heads into the woods on the right side of the road. Angle NW and cross sand 6-Mile Rd. The next section includes a new re-route which is under construction and flagged to avoid a section that previously crossed private land. Permission is not granted to cross this land. Stay on the re-route! There is some swampy area in here. Reach Freesoil Trailhead. The trail comes in behind the kiosk, and angles NW across the road (not in the wide obvious old road which is directly opposite the TH). Pass through some berry bushes growing between red pines and make a sharp turn W on an old RR grade of the Manistee and NW RR. This continues through an interesting bottomland hardwood swamp, with 5 small bridges across channels. Look for several types of ferns, and leatherwood. In just under 0.5 miles the trail will angle uphill to the N and leave the RR grade. Follow the ridge above the wetland, and then the trail wanders up and down some small hills. Reach the turnoff to Bear Track Campground, which is 1.1 miles N of this point (white blazes on side trail). There is a WATER pump at the campground in summer. Continue just a few more yards and drop down to Tyndall Rd. Access- Parking at Freesoil TH which is just into Lake Co on what is Freesoil Rd in Mason Co, and 8-Mile Rd in Lake County. Information kiosk, not a fee site. You could park at Bear Track Campground and hike the connector to the NCT. Fee site. Bear Track is just north of Riverside Drive at the boundary of Mason and Manistee Counties. Distance and time- 12.4 miles, about 5 hours. Potable Water- summer only - hand pumps at Bear Track. Faucet at Bowman Bridge. Homeowners along 5-Mile Road might assist a hiker who needs water. More- Visit the NCTA official web site for more information. The NCTA has full-color, topographic, field-checked maps of this section. Call 1-866-hikeNCT. 76th St Trailhead- Turn west at the BP station south of Baldwin on M-37. This is 76th St, and you will reach the trailhead in about 3 miles. 56th St Trailhead (Bowman Lake)- From Ludington/Scottville, go east on US 10 to Walhalla and turn south at the blinker. Take a left at Kinney (following the main route) and this becomes 56th St. About 8 miles to the corner of Evergreen. Continue "straight" (the road takes a little twist) and the trailhead is in about one more mile on the left side of the road as you begin downhill. Do NOT go all the way to Bowman Bridge Campground! Or from Baldwin, turn west on 7th St, go 5 blocks to the end and turn left. In one block make a right on Carr Road which becomes 52nd St. The road will jog south and become 56th St. 4.5 miles from MI-37 in Baldwin you will reach Bowman Bridge and the campground. The trailhead is another 1.5 miles on the right as you go up the hill. Upper Branch Bridge- Turn south on Tyndall Road at Branch, MI on US 10. Take a left on Stevenson Road (before the railroad tracks), and this will curve right in a mile. In about another mile you will cross the Pere Marquette River, and the parking area is immediately on your right. Timber Creek- Located on the north side of US Highway 10, 3 miles east of Branch and 7 miles west of the junction of US 10 and MI-37. Or from M-37, take 10-Mile Road to Irons and turn south on Brooks Rd. Stay on the pavement which will jog a bit, but eventually turn east on 8-Mile Road. TH is approximately 8.5 miles from Irons. 5-Mile Road- There is a small grocery store 1/4 mile east of where the trail goes south from 5-Mile Road, the Sauble Lake Emporium, 231-266-5641. They will allow you to park in back of the store if you ask. There is NO parking allowed where the trail comes into 5-Mile Road from the south.